Scott Mc Laughlin is a composer and free-improviser (cello, live electronics) based in Huddersfield, UK. Born in Ireland (Co. Clare) in 1975, he wanted to be a scientist but instead spent his early 20s playing guitar in art-indie bands between Galway and Belfast. Slowly he discovered more experimental non-pop musics, leading to a foundation course and subsequent BMus degree in music at the University of Ulster at Jordanstown, completed in 2001. Somewhere between that and completing his PhD at the University of Huddersfield in 2009, he reconnected with science via music, with the help of supervisors Pierre Alexandre Tremblay, Bryn Harrison, James Saunders, and Christopher Fox. Currently he teaches composition and music-technology at University of Leeds, and still enjoys reverb-drenched feedback. 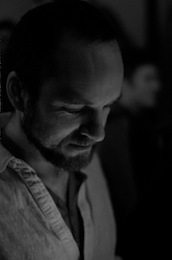 His research is compositional, a practice-led exploration of the physical materiality of sound and the local teleology of performance, combining approaches from experimental music with dynamical systems theory and philosophy to explore autopoiesis and recursive feedback systems in constraint-based open form composition: especially concerning resonance and perceptual ambiguity on both macro/formal and micro/spectral scales. His music is concerned with relationships between minimal processes of transformation and proliferation: ideas of recursion, hysteresis, difference, cluster-microtonality, chaos/complexity theory, and interactivity. Recent performances have been given by Manon Quartet, Dublin Sound Lab, National Symphony Orchestra of Ireland, LSTwo, and Mira Benjamin. Scott's current research takes non-linear and unstable elements of instrumental sound and treats these as locally unpredictable systems (weighted unpredictability, similar to markov chains) within globally indeterminate cybernetic system of performer-score-instrument. For example, the set of single-reed pieces there are neither wholes nor parts (2011-13) uses only multiphonics but treats each multiphonic as a system with multiple possible pitch outputs of varying probability: wind multiphonics are unstable at low dynamics, and may collapse onto one of several possible pitches. The score guides the player with a preferred path, but the nature of the medium allows for other possible outcomes which then determine the multiphonic chosen next. The string quartet a metastable harmony (2012) applies this principle to strings, where drone-bowing of open strings, becomes a reservoir of possible partials isolated by right-hand techniques only. The constant feedback between bow-activity and formant resonance is a hysteretic system where resultant pitches act as targets to guide the performance. The cello solo intra-actions (2013) and work for six electric guitars surfaces of emergence (2013) build on this by altering the environment of the instrument with periodic gradual detuning. 22/02/2019 (1pm), In the unknown there is already a script for transcendence for prepared-piano and magnetic resonators, played by Zubin Kanga at the University of Leeds International Concert Series, Clothworkers Concert hall, Uni. of Leeds. 7/02/2019, In the unknown there is already a script for transcendence for prepared-piano and magnetic resonators, played by Zubin Kanga at the Free Range in Canturbury. 17/11/2018 (4pm), In the unknown there is already a script for transcendence for prepared-piano and magnetic resonators, played by Zubin Kanga at the Huddersfield Contemporary Music Festival, Phipps Hall, Uni. of Huddersfield. 23–24/06/2018, Bee Music (draft 1) for tape will be presented at Rothamsted Research 'Festival of Ideas', Harpenden. 24–26/05/2018, Perisonic (full version) has been selected for installation at Elektro Arts Festival, Gheorghe Dima Music Academy in Cluj-Napoca. 14/01/2018, Perisonic will be performed in full at Schwankhalle, Bremen. 1/7/2017, Cartographies of Sheet Metal for multiple bowed cymbal players. Performed by Scott Mc Laughlin and Joe Whelan at Performing Indeterminacy conference in Leeds. 29/4/2017, Threads of the Social performed by LSTwo Strings (string ensemble) and Mira Benjamin at Leeds International Concert Series in Clothworkers Centenary Concert Hall, Leeds, 19.30pm. 17/3/2017, M. Grisey, his Galliard (string orchestra, 2005), Bifurcations (clarinet quartet, 2007), and Blues for Horatiu (piano, 2016) at Minzu University, Beijing. 7/12/2016, Reciprocal Structures performed by Scott Mc Laughlin (prepared cello) at Sounds Between Festival in Guildford, 5.30pm. 5/12/2016, bifurcations in continuous systems performed by Michael Quinn (kbd) at Smock Alley in Dublin, 8pm. 4/12/2016, Reciprocal Structures performed by Mira Benjamin (vln), Dom Lash (bass), and Scott Mc Laughlin (feedback guitar) at Hundred Years Gallery in London, 4pm. 9/9/2016, multistable objects assembled around a common point performed by Duo Hevans (Eleri Ann Evans & Henri Bok) at 'Doctors in Performance' conference, Royal Irish Academy of Music, Dublin. Summer 2016, the wonderful Mira Benjamin takes my new concert-length piece for violin and live electronics, The Endless Mobility of Listening, on tour to Canada (BC) and UK. May/June 2016, Snowflake performed by Juliet Fraser at: 5 May BARBOUR ROOM, SAGE GATESHEAD; 14 May HEPWORTH WAKEFIELD; 18 May UNION CHAPEL BAR, LONDON; 18 June PENINSULAR ARTS, PLYMOUTH UNI. 16/5/2016 I'm very pleased to have been selected to participate in Composer Lab. My first orchestra piece will performed by the RTÉ National Symphony Orchestra in Dublin on May 16th. 29/2 - 2/3/2016 'The world according to Bob', a celebration of the work of Bob Gilmore, a good friend who is greatly missed. Blues for Horatiu for solo piano performed by Reinier van Houdt at Cafe Oto on weds evening in London. And another performance of Untitled (for Bob) performed by Trio Scordatura on 7pm on Tuesday at City University. 29/11/2015 Untitled (for Bob) performed by Trio Scordatura at muziekgebouw (Amsterdam) as part of 'Nicola Vicentino, a second life' at MicroFest Amsterdam 2015. 23/11/2015 (midnight show) Reciprocal Structures performed by Dominic Lash at hcmf// shorts. 17/11/2015 Reciprocal Structures performed by Dominic Lash at Circus London as part of collaborator Shelley James' exhibition. 06-07/11/2015 & 14/11/2015 in Wiltshire, Snowflake performed by Juliet Fraser at Corsham, Upavon, and Minety. 9/9/2015, London, Cafe Oto, 'wax-on, wax-off'. (related to bifurcations in a continuous system). Requested by Tom Mudd for his Control exhibition. 21/5/2015, Leeds, objects exceed our access to them for (euph, cl, fl, sax, amplified cymbals). LS2 Ensemble, Clothworkers' Centenery Concert Hall, University of Leeds. April 2018 "Notating Materiality", video-paper given at the Material Cultures of Music Notation conference in Utrecht. Oct. 2017 "Material Indeterminacy and De-centred Practice", guest lecture given at SoMA, Bath Spa University. Sept. 2017 "Material Indeterminacy", paper given at ISACS2017 conference, ZKM. Nov. 2016 "Materiality Topologies and Critical Technical Practice", paper given at Orpheus Institute (Ghent, Belgium) at the Composition as Critical Technical Practice Symposium. Oct. 2016 "Materiality, Topology, Indeterminacy", composition seminar given at University of York. Jan. 2016 "Material Agency and Indeterminacy as Musical Structure", a public lecture given at University of Wolverhampton, video here. Sep. 2013 "intra-agencies", CeReNeM Journal, issue 4. Aug. 2012 "If a tree falls in an empty forest…: Problematization of liveness in mixed-music performance", Journal of Music Technology and Education, 5/1, Summer 2012. Jun. 2012 "Imperfect balance: Musical composition by exciting periodic and near-chaotic regimes in coupled metal cymbals", 5th Chaos Simulation and Modeling Conference, Athens. Jun. 2012 "Issues in Application of Chaos in Acoustic Composition", 5th Chaos Simulation and Modeling Conference, Athens. Jan. 2012 "There are Neither Wholes nor Parts: Issues of notation and Performance with Multiphonics" joint paper with Iain Harrison, SPEEC, Uni. Of Oxford. Oct. 2011 "Framing, Filtering: Sites of Indeterminacy in the Text Scores of Manfred Werder", "Word Event" (text-score conference), Bath Spa University. Sep. 2011 "Hysteresis and Recursion in my Recent Music", Music and Minimalism Conference, University of Leuven. July 2011 Whitewater on Eric Honour's, Phantasm: Music for Saxophone and Computer, 2011 Ravello Records. Mar. 2011 "Dynamic Systems and Analogy in Experimental Music", Chaos Simulation and Modeling Conference, Technical University of Crete. Also to be published in proceedings book in 2012. Mar. 2011 "Schema for Undermining Memory in Experimental Music", Time's Excesses Conference, University of Caen, France. Mar. 2011 "Problematisation of Live-ness in Mixed Music Performance", FiMPAC, Leeds College of Music. Nov. 2010 "SpectralConway: Cellular Automata off the Grid", Earzoom, Ljubljana. Nov. 2010 "Dissolution: a Study in Collaboration", with S. Berweck, RMA Study Day, University of Leeds. Aug. 2010 "SpectralConway: Cellular Automata off the Grid", ICMC 2010, New York. Mar. 2010 "What Remains: musical structure as a function of notation in experimental music. ", Off The Staves Conference, Bangor (Wales). Mar. 2008 Bifurcations included on CD compilation, 'Contemporary Music from Ireland: Volume 7'. Published by Contemporary Music Centre, Dublin.